The Graco SnugRide Click Connect 40 is the only Newborn to 2-year infant car seat that keeps your baby rear-facing for a full two years as recommended by the American Academy of Pediatrics. It grows along with your child from 4 lb newborns through 40 lb toddlers, keeping them comfortable and safe. It's also the first offering in Graco's Click Connect collection, which allows parents to move infant carriers from car to stroller with a simple one-step click. Ingenious! I think it's the smartest development in baby gear since the LATCH system. As a long-standing parent ambassador of the Graco Nation, I was excited to be offered the chance to shop for a new SnugRide 40. My kids are obviously too old for this innovation (at 5 and 8, they are firmly in TurboBooster territory) but luckily I have friends who are expecting their first baby. They have barely registered and I was already telling them about how my kids loved their SnugRides. Roo would only sleep in her SnugRide, which I referred to as the baby bucket. I would actually put it into the Pack N Play next to our bed at night. 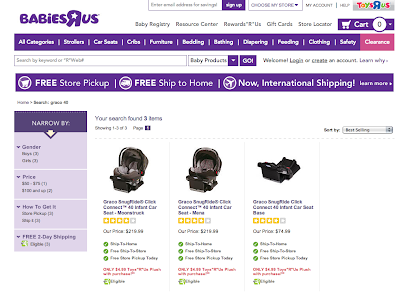 The Graco SnugRide Click Connect 40 is exclusively sold at Babies R Us. It's available in two colorways so far: Mena, a scrolling floral for girls, and Moonstruck, a more abstract pattern for boys. When I went to shop for them, I found out how popular they were– there were only a few carseats on the shelves and all of them were in the Mena pattern. Inconvenient, since I had discovered my friends were expecting a little boy. The Mena pattern is pretty but definitely too girly for a boy, right? Look how plush the cushions are– it looks so snuggly. Five point harness and headrest are fully adjustable (with one hand, even!) so they won't cramp your kiddo's growth. Or force you to rethread the straps, which is one of the most arduous tasks, ever. Moonstruck is more suitable for boys. Still has a pretty pattern but it's not pink and girly, so your newborn's masculinity is not called into question. I mean, you don't want him to grow up with issues, right? Just kidding. The SnugRide Click Connect base holds your infant carrier securely in your vehicle. What makes this one unique is how the base adjusts to accomodate leggy toddlers. I especially appreciate that it also creates its own footrest that helps to protect your upholstery from those aforementioned leggy toddlers. I wasn't able to buy the Graco SnugRide Click Connect 40 in Moonstruck while I was in the store but it was available online with free shipping. Most items ship within 24 hours! You can also have it delivered to your local Babies R Us or Toys R Us location, free of charge, if it's more convenient. For more information, visit http://www.gracosafety.com/ or follow Graco on Facebook or Twitter. You want to talk about a baby shower gift that keeps on giving… this carseat will work from birth through toddlerdom! Would you like to win one? Enter using the form below. In accordance to the FTC Guidelines and the WOMMA Code of Ethics, I am disclosing that I am a Graco brand ambassador and received a gift card to purchase the carseat and review it. Graco is also supplying the prize for this giveaway. No additional compensation has been received and, as usual, all opinions are my own. I love that this carseat grows with baby from infant to toddlerhood AND it's a carrier! Amazing! My favorite feature is that its made to keep your baby rear facing until 2 years by going up to 40lbs! Great giveaway! I like that a child can be rear faced until 2 years of age and also the click connect system! Very nice features and wonderful product! I favorite feature is 8-position adjustable base grows with your child. I love this seat! I like that it offers extended rear-facing height/weight limits, a kick plate to keep my back seats clean from dirty shoes, and a built in lock off. I am super excited about this seat, and I would love to win one! Thanks! My favorite feature is that it keeps the child rear facing for the full two years. Rear facing till age 2 is awesome! Of course I love that I can use ONE car seat for an entire 2 years rear facing, but I also love that it goes up to 40lbs too. My SIL is expecting (I'd give this to her) and her kids are always beasts (I'm totally serious). This is a seat the new baby won't outgrow in weight like many other seats would. I love the adjustable positions. I like the 40 pound weight limit. I love the Moonstruck carseat! I love how long you can use the seat and adjustable it is! My favorite feature is the non re-thread harness and the higher weight limit. I love the kick board feature to protect your car's seat! I love the easy adjustment and the mena print is adorable! The fact that my daughter can actually sit rear facing without looking like she is stuffed into her car seat. I like how the base adjusts for more leg room. On the last rafflecopter entry, I mistakenly entered my twitter name and not my pinterest name. My pinterest name is "Al Nielsen". Thanks for the giveaway.